Ladies and Gentlemen, we have an absolute highlight in metals 2018: Kreator and Dimmu Borgir will hit Europe with an extended tour - and they have company! Hatebreed and Bloodbath will join this glorious madness, for which Kreators Mille Petrozza promises: „I am more than excited to team up with three of the strongest and most unique bands in todays metal world for this killer package. For this run, we have prepared the biggest production in the history of the band to bring the ultimate KREATOR-experience to a hall near you. The European Apocalypse will be THE tour of 2018, and I can`t wait to see all of you in December. Hail to the Hordes!" 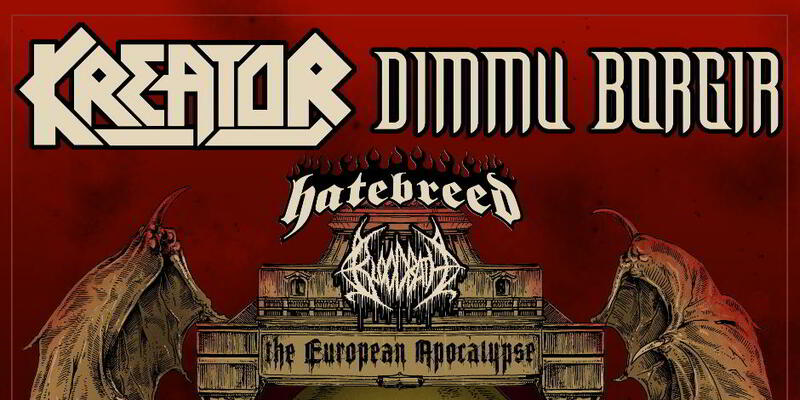 Tickets are available now from europeanapocalypsetour.com and in an exclusive bundle from Metaltix!